I’ve always thought that the stereotype of the dirty old man is really the creation of a dirty young man who wants the field to himself. I have no ego investment in being on the air. I don’t knock others for whom that kind of attention is like oxygen, but I don’t miss anything about it. Hugh Malcolm Downs was born in Akron, Ohio, USA. He is an American broadcaster, news anchor, TV producer, author, game show host, and composer. 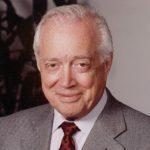 He is perhaps best known for his roles as co-host of the NBC News program Today from 1962-71, host of the Concentration game show from 1958-69, and anchor of the ABC News magazine 20/20 from 1978-99. He also served as announcer for Tonight Starring Jack Paar, host of the PBS talk show Over Easy, and co-host of the syndicated talk show Not for Women Only. He worked as a radio announcer and program director at WLOK in Lima, Ohio, after his first year of college. He has written several books include: Yours truly, Potential: The Way to Emotional Maturity, Thirty dirty lies about old, On Camera, Fifty to forever, Perspectives, and Greater Phoenix.